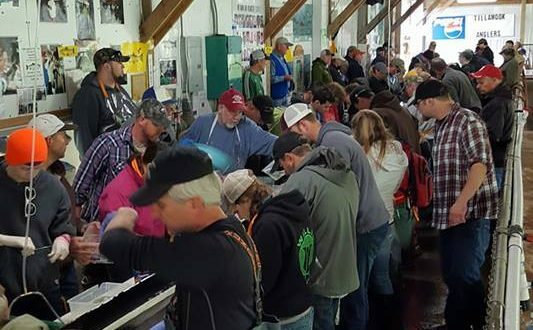 Please join Tillamook Anglers for our 30th Annual Fin Clipping! We will be clipping 100,000 Spring Chinook Salmon in preparation for their release into your Tillamook County fisheries. Kids are welcomed and encouraged to attend and there will be a silent auction, raffle drawings, a FREE BBQ and mini garage sale. Young children need adult accompaniment, please. This is a great opportunity to participate in the stewardship of our local fisheries and one of Oregon’s most important resources! There is also a work party on Wednesday, April 11th at 8:30 am if you’d like to help set up for the event.